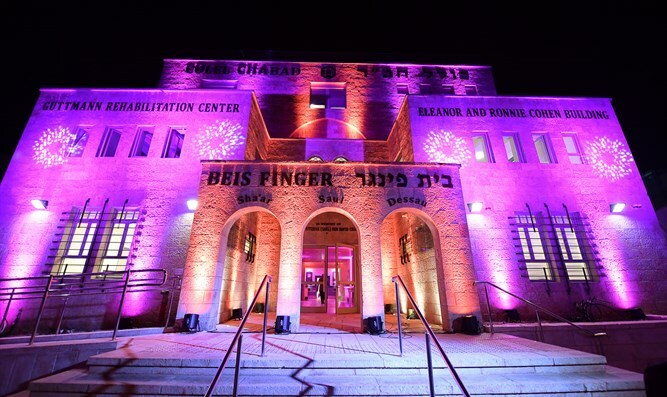 The four-floor building will be operated by Colel Chabad, Israel’s longest running social services organization helping the country’s needy since 1788, with support from Israel’s Welfare Ministry. It was dedicated by Gershon Finger, as well as by Eleanor and Ronnie Cohen, Roberto Guttman, Alan and Deborah Kestenbaum, Lord Steinberg and the Nigri family. Medical equipment and furnishings were made possible by the Ted Arison Family Foundation and Bituach Leumi (National Insurance). Featuring a state of the art music therapy room, art room, physiotherapy, occupational therapy and cognitive therapy rooms the residents will also be able to take part in specialized holistic and horticultural garden therapy. Jerusalem Mayor Nir Barkat, Chief Rabbi David Lau and Director General of the Bituach Leumi Meir Shpeigler were on hand for the opening ceremony and ribbon cutting on the anniversary of the passing of the Alter Rebbe, Rabbi Shneur Zalman of Liadi, the founder of Chabad and Colel Chabad. Expanding on the model first advanced by Colel Chabad at the Grabski Rehabilitation Center in the northern town of Migdal Haemek, this new facility is intended to be accessible to those from the Central region of the country, while being situated in the heart of the nation’s capital yet accessible to the needs of the physically disabled. The building and surrounding area were designed by Nahum Meltzer, a leading architect whose expertise in redesigning historical buildings to be accessible comes from his personal understanding. Meltzer is the father to a son with multiple sclerosis which motivated his understanding of the specific needs of the disabled community. Meltzer was also behind the landmark redesigns of the Knesset as well as the Hurva Synagogue in the Old City, rebuilt in 2010 after being destroyed by the Jordanians following the 1948 War of Independence . The facility also includes a designated gathering space for the elderly and lonely to have a warm meal and company, similar to the tens of other soup kitchens and gathering spaces run by Colel Chabad around the country.